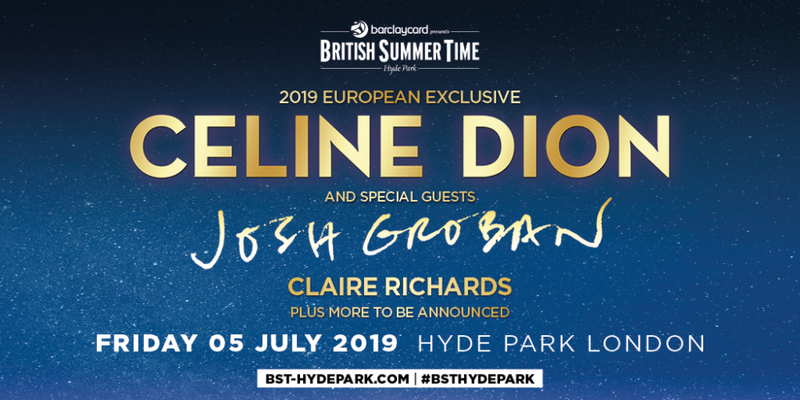 Barclaycard presents British Summer Time Hyde Park announces a titanic headliner to kick off the 2019 London Hyde Park concerts – the legendary Canadian vocal powerhouse – Celine Dion. Celine Dion has sold over 240 million records worldwide (more than any other BST Hyde Park headliner to date) and is renowned for incredible live shows and a monumental vocal range. She will be one of the most unforgettable acts to have ever graced the Great Oak Stage in Hyde Park. "It's my first time doing a show in beautiful Hyde Park.... I'm so excited. I love London and it's a great honour for me to be part of the Barclaycard presents BST Hyde Park concerts. I can't wait.... summertime in London, here we come!" To add to the enjoyment of your special day in London's Hyde Park, you can choose from a range of Official Ticket Experiences including a Ticket or VIP Ticket and Overnight Hotel Stay in the city or relax and enjoy the exclusive ** ULTIMATE BAR EXPERIENCE ** including Barclaycard VIP Summer Garden Tickets with access to GOLD CIRCLE STANDING or choice of DIAMOND CIRCLE Tickets, right in front of the Great Oak stage! - Arrive to a Welcome Glass of Fizz, Complimentary Bar, Comfortable occasional Seating, (The Ultimate Bar is an Exclusive Area restricted to The Ultimate Bar Pass Holders Only) The Ultimate Bar opens @ 1PM (TBC) - Public Doors 2PM - Whatever is right for you, British Summer Time will provide all the ingredients to enjoy your day in London's Hyde Park, with an incredible line-up of Artists and music! Céline Dion BST Ticket and Hotel include a choice Primary Entry (early entry), Gold Circle, Barclaycard VIP Summer Garden, Diamond Circle and The Terrace tickets and a comfortable night in the UK's famous capital city - Extra night stays are also available. Provisional Times - Gates Open: 14:00H – please note the gates will be open approx. 60 minutes early for those customers who select Primary Entry, Gold Circle, Barclaycard VIP Summer Garden, Diamond Circle, The Terrace and *The Ultimate Bar * Opens @ 13:00H or arrive at your leisure - Age restrictions - Anyone under 16 must be accompanied by a parent or guardian (18 or over) - Disabled Access - All tickets are available via the festival website or AXS.com. There is a Wheelchair platform and an Ambulant area. All tickets come with 1 free personal assistant. We regret that special access tickets are only bookable via the BST website.